The idea of the Frauenzimmer was imported to Cleves from Burgundy in the 15th century. The Frauenzimmer was part of the overall noble household, but was separate from that of the master’s. The term encompassed the people who comprised daily life in the Frauenzimmer, such as the lady of the house, her daughters, a Hofmeisterin or governess, cousins, wards, and attendants. The Frauenzimmer was not unique to Cleves or the Lower Rhine area, and spread eastward into Poland. Frauenzimmer was also used as a collective noun to describe a noblewoman’s ladies-in-waiting. The purpose of the Frauenzimmer was to provide training to young noblewomen on how to run a household, cook for the household, mend clothes, embroider, and other practical tasks. Visits from men to the Frauenzimmer were limited. No male over the age of 12 years was allowed to be a member of the Frauenzimmer, and men were expressly forbidden from visiting the Frauenzimmer at night. Exceptions were made for the physician. A woman’s life at court was subject to ordinances surrounding the administration of the Frauenzimmer. The ordinances, or written laws, gave instructions regarding moral behavior of the women in the Frauenzimmer. This included when and how the women and girls were allowed to interact men, and construction of the hierarchy within the Frauenzimmer. Only certain individuals were allowed to have keys to the Frauenzimmer. The types of dances the ladies of the Frauenzimmer could enjoy were restricted, as well. No detail was spared in regulating a court’s Frauenzimmer. There were contractual arrangements, saying who did what for whom, and how they were compensated for the work. A person could receive anything from food or clothing, to shelter or horses. Money was an option, too. Meal time was very strict, with specific instructions for where each lady sat, who was allowed to eat what, when and how the dishes were presented, and so on. A Frauenzimmer had its own kitchen staff, but it was much smaller than that for the general household. The evidence of Anna of Cleves’ exact activities within the Frauenzimmer as a girl and young woman are not known. However, there is evidence that hunting was a pastime enjoyed greatly by both the courts of Jülch-Berg and Cleves-Mark, and that the closely watched Frauenzimmer occasionally partook in these festivities. Anna learned to cook and embroider for, and administer a household. She learned how to care for the other young girls in the Frauenzimmer. She might also have been exposed to childbirth, something which sometimes occurred within the Frauenzimmer. Anna carried on some of the traditions from the Frauenzimmer after her arrival in England. Once her marriage to Henry VIII was annulled, Anna was given her own household. There are anecdotes about her dabbling in cooking. Perhaps Anna enjoyed making food for herself and close members of her household, as she learned to do during her childhood and youth in the United Duchies. Anna’s upbringing was very different from her English counterparts, but should not be considered as inferior. 1. 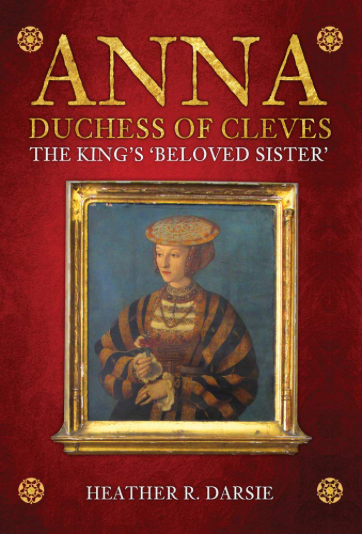 Darsie, Heather R. Anna, Duchess of Cleves: The King’s ‘Beloved Sister.’ Stroud: Amberley Publishing (2019). 2. von Schweinichen, Ritter Hans. Lieben, Lust und Leben der Deutschen des 16. Jahrhunderts. Breslau: Josef Mar (1820). 3. Réthelyi, Orsolya. „Mary of Hungary in Court Context (1521-1531).” Central European University, Budapest (2010). 4. Norton, Elizabeth. Anne of Cleves: Henry VIII’s Discarded Bride. Stroud: Amberley Publishing (2010). 5. “Frauenzimmer, das“ https://www.duden.de/rechtschreibung/Frauenzimmer Retrieved 20 March 2019. 6. “Frauenzimmer, das.“ https://www.dwds.de/wb/Frauenzimmer Retrieved20 March 2019. Wonderful Heather Darsie has changed History with this book. Our Family holds that she had twins girls hidden from the Kings Attorney’s when they came to investigate the alleged Birth of a Son William to Anne Sept 10, 1541. The Girls were given to long time Windsor Castle Stewards Margaret Artbroke Chalfant and her husband William Chalfant ca 1485-1542. The money left to the family by Anne of Cleaves secured the purchase of 220 acres of land from William Penn when both emigrated to the USA. My Chalfant ancestors brought the Queens J2a Central SPAIN mt. DNA to America in the 6 chalfants marriages prior to Collins, Cookston to Rice my family and all my sisters and mother and her sisters Carry this important marker from the sister of the Holy roman Emperor Ferdinand II…..who’s sister married the Duke of Cleaves. Although not yet a scientific fact I wonder if the Author had come across this family CHALFANT of Windsor in her research? D. Chrles Rice 1948 of the Nebraska Rice’s 10th great grandson of Anne of cleaves if True. Although there was a rumour during the Spring and Summer of 1541 that Anne of Cleves was having a child by Henry Viii who visited her on several occasions and Kathryn Howard thought he may leave her, there is no contemporary evidence to substantiate any claims that Anna had any children. Henry Viii was aware of the rumours and put a stop to them. Family history is always interesting but I am afraid this is only a myth. This book is brilliant, there is evidence of a lot of research, the new evidence on the account by Thomas Cromwell and the political events and how they impacted on the outcome of the marriage. However, the book lacks proper notes and references, which is very disappointing as I usually research further. It may be obvious where letters are cited in the text but in some cases the sources are not even cited in the text. This is unacceptable in academic circles and makes it difficult to follow up on the original sources. Yes, there is a good bibliography, but not every exact reference is listed. For one example, pages 258 and 259, the author refers to reports on the situation at Court between Mary and Elizabeth and attendance at Mass but makes no mention of who the report is by. Therefore I can’t refer on to read the text myself. I appreciate that much work has been done on this book, the research is clear but if you research, I am sorry but proper references are essential in the text and the notes. I have read excellent articles by Heather in the Tudor Society so I do understand how much work has gone into this work. However, a lack of proper reference notes and citations detracts from it and doesn’t allow for further research by us historians.